Bats are extremely valuable in insect control and a welcome and often misunderstood part of Iowa's natural environment. We want them flying around outside gobbling mosquitoes, crop-damaging insects, and others. We just don't want to share their living space with them! Click here to learn more about Iowa's bats and the challenges they face. Like almost all other animal species, Iowa law protects bats. While homeowners are allowed to protect their property, repellents are largely ineffective, including those expensive "sonic" or "ultrasonic" devices and the relatively inexpensive mothballs. Thus, excluding bats from buildings is the only way to deal with them. Understanding some bat habits is the key to successful exclusion. First, bats are nocturnal. They emerge from their roosts at dusk each evening, searching for food and water. Thus, exclusion activities must be done after they've emerged, NOT during the daytime. Blocking entrances during the day only guarantees more severe problems, increasing the likelihood that they will come down through the walls in search of a way out or die in the house, causing a different set of problems for the homeowner. Second, bats follow air currents. Any spaces--say, your attic and a bedroom--that have different temperatures and are connected by a crack or hole, automatically have airflow between them. Bats simply follow those air currents. Blocking those air currents is the key to successful bat exclusion. Third, August and September are the best time to do the exclusion. Bats are mammals and often form maternal colonies, a mother and her one or two young hanging together with dozens of other mothers and young. Since young bats are naked and blind, mothers leave them behind each night to seek food and water, returning later in the night to nurse. If exclusion is done prior to August you may only exclude the mothers and end up having the young die in your house. Finally, only two of Iowa's nine bat species, the big brown bat and little brown bat, commonly use buildings in the summer for colonies. Only the big brown bat uses buildings in winter. It is mainly these two species that cause problems for homeowners. Wait until after August 1st to exclude bats to ensure flightless young are not orphaned inside the home. Step 1: Find the entry points. Finding the entrance can be a family affair. Take lawn chairs, your favorite drinks, and a flashlight and sit outside in your yard about sundown. Watch for emerging bats. Check the obvious places first: around the chimney, gable vents, or roof vents. Don't forget the not-so-obvious places also: under the eaves, behind the rain guttering, under torn shingles. All these are common entrance sites and indicate that some repair is in order. Some buildings have more than one entrance site. Any holes the size of your thumb or larger are enough for bats to find and exploit. 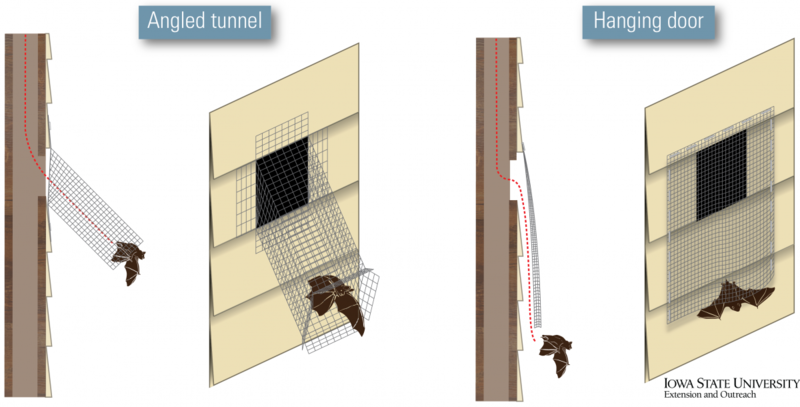 Don't forget, many bats may use the outside of your house without posing any issues to the inside, so be sure to find likely entry points, as illustrated in this figure. Step 2: Allow the bats out, but not back in. Once you've identified the entry points around your home build a one way door on the outside of the house to allow the bats to crawl out of the hole, but not fly back in. A one-way door will be anchored above the hole and then hang loosely below. It can be made from half-inch mesh bird netting, screen wire, heavy cloth, or even a sock with the end cut off to create a tube around the hole. Let's say, for example, the entrance is a crack one half inch wide and 6 inches long. Cut a piece of netting or screen. Place it over the entrance crack so that the entrance is in the upper half of the net/screen. Use duct tape to tape the top and two sides of the screen to the building, leaving the bottom edge open and just loose enough for the bats to squeeze out. Bats will emerge that evening, hit the screen, crawl around until they find the bottom loose, and then fly out. When they return, they return to where the air current is--the crack--not to the bottom of the screen. If you leave this up for 4-7 days, you can be assured that all bats are out and the repairs can be made, this time during the daylight hours. Use foam sealants, fine (half inch or less) wire mesh, new boards or soffit, plaster, or any other means necessary to fill all holes in and around your home to prevent bats from finding their way in again. For more detailed information on issues with bats around the home visit the detailed article on bats from the Prevention and Control of Wildlife Damage manual.